It's a nice summer day and you've spent the afternoon mowing the grass in your yard and it's now neatly trimmed and looking good. You go to bed that night with a sense of accomplishment. While you're asleep a couple of cretins meet in front of your house and transact a drug deal while standing (in the dark) on your front lawn. You have no idea this is going on because it's the middle of the night and you are sleeping. You are awakened in the morning by the police pounding on your door. They have captured the two druggies and now they are here to “arrest” your lawn, seize your house, and throw you out into the street. Far fetched, right? Not really. It's all legal (in the U.S. of A) under a procedure known as “civil asset forfeiture.” Keep your eye on this because a main advocate of this is Jeff Sessions, the Trump pick to be the next Attorney General of the United States. It gets even more bizarre. Some Republicans and conservatives initially favored the procedure under the belief it was tough on crime. Then they turned against it as government over reach and roundly criticized the Obama administration for not doing anything to change the laws. Now being against civil asset forfeiture, having Sessions as the AG would seem to be just the opposite of what they want done (to get ride of this). “Nebraska’s unicameral legislature — the only one of its kind in the nation — passed the bill by a wide margin, reflecting the widespread and bipartisan recognition that forfeiture laws have strayed from their original, narrow, and laudable purpose,” wrote Jason Snead, a policy analyst in The Heritage Foundation’s Edwin Meese III Center for Legal and Judicial Studies. 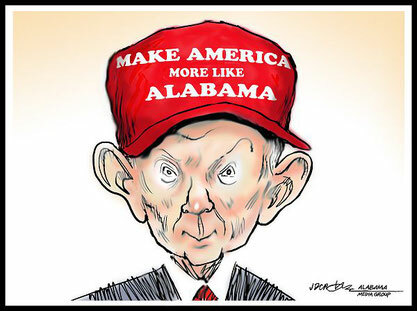 Now let's all hope that Jeff Sessions is not successful in undoing the progress that has been made. Every American deserves a front lawn safe from unwarranted government seizure.